Frosted Team Hoping for Sweet Kentucky Derby: When trainer Kiaran McLaughlin declared Cairo Prince out of the Kentucky Derby last year, the entire team, including owner Godolphin Racing, understandably felt disappointed. In fact, McLaughlin even told a Blood-Horse reporter, “All my staff and all my family…it’s the toughest day of my career as a trainer.” That comment indicated just how highly they thought of Cairo Prince. This year, the same owner and Team McLaughlin receive a second chance with Frosted, a gray son of Tapit who recently won the Grade I Wood Memorial at Aqueduct. 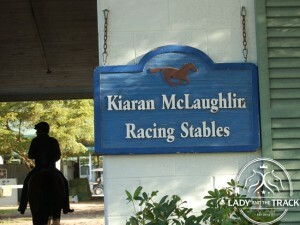 The office manager for Kiaran McLaughlin Racing, Cate M. Johnson, recently offered a few words on Frosted’s upcoming plans and her boss Kiaran. 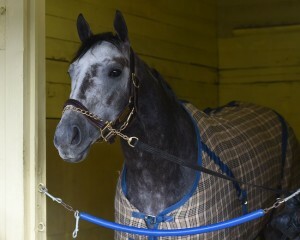 She revealed that Frosted is currently waiting at Belmont Park and will not ship to Churchill Downs until the fourth week of April. 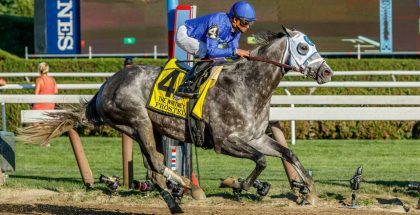 Johnson confirmed that Joel Rosario is expected to retain the mount, and she also provided some insight into Frosted’s name. “Darley names the horses…all I can guess is that with his mother being Fast Cookie and his sister being Macaroon, Frosted may be a cookie reference, but I’m not sure on that one,” Johnson said. Johnson considers the three-year-olds trained by Bob Baffert and Todd Pletcher to be the ones to fear in this year’s Kentucky Derby, which include Dortmund, American Pharoah, Carpe Diem, and Materiality. American Pharoah just romped in the Arkansas Derby and caused quite a stir on various online horse forums. 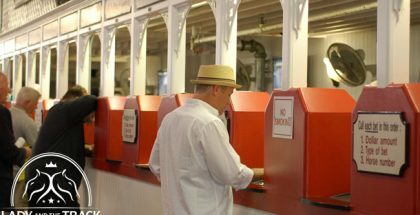 On the positive side for handicappers, Frosted’s betting odds are expected to range anywhere from fair to an overlay because of the hype concerning the above colts. Johnson spoke about why the Derby is special for McLaughlin and of his wardrobe plans. This year, the same owner and Team McLaughlin receive a second chance with Frosted, a gray son of Tapit who recently won the Grade I Wood Memorial at Aqueduct. That last tidbit should provide extra motivation for supporting Frosted. McLaughlin has endured the ups and downs of a training career as well as in life. Like Pletcher, McLaughlin once worked as an assistant for Hall of Fame trainer D. Wayne Lukas from 1985 to 1992. Eventually he moved on from Lukas and began to split his time between America and Dubai where he became the leading trainer at Nad Al Sheba Racecourse three times. In 1998, he was diagnosed with multiple sclerosis. McLaughlin has accomplished a lot in his training career. The list of races shown on his Wikipedia page is impressive. However, the Derby has eluded him, although he did come close in the 2005 edition when Closing Argument lost by a half-length to Giacomo after racing slightly off the leaders in sixth. Frosted might emulate that strategy or even sit further back. His tactics in the Wood Memorial were more conservative than his previous form which gives Rosario more options. Johnson ended the conversation by hoping Frosted’s fans will cheer for him on the first Saturday in May.